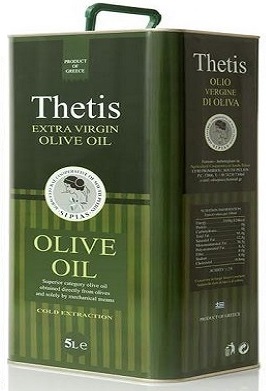 An excellent range of olive oils full of flavour and natural aromas. 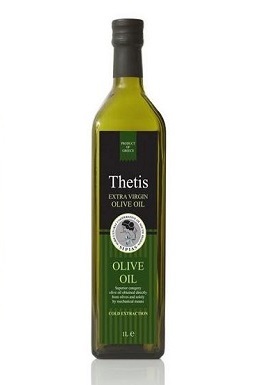 Our Extra Virgin oil, Thetis, has a superb richness and quality of flavour and makes it the perfect dressing for salads. For cooking it is well suited to simple dishes, where the flavours and aromas of the dish can combine with that of the oil. 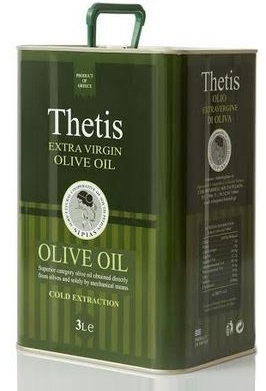 Our Virgin oil still retains the flavours and aromas of the Extra Virgin oil, yet carries a lower price which makes it well suited for cooking and everyday use. Its acidity is always less than 1.5%. 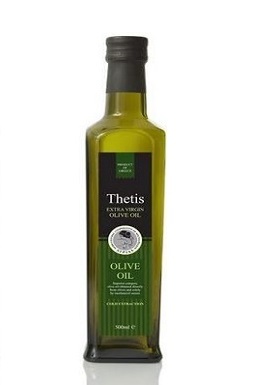 Our superior Green Oil is produced at the beginning of each season, from green olives. This produces an oil with a robust aroma and a stronger, leafy green taste. This crop has a very small window for harvesting and the green olives produce significantly less oil per olive than the ripened black olives. But the flavour is second to none and is literally considered by those who are in the know regarding olive oil, to be liquid gold. Accordingly, this rare Green oil is much sought. The olive tree (Olea europaea) is an evergreen tree, rarely growing taller than 15 metres, native to the Mediterranean, Africa and Asia. It originally came from Asia Minor and spread along the Mediterranean coasts. Palestine, Syria and Crete began cultivating the edible olive more than five to six thousand years ago. Olives were grown commercially in Crete as long ago as 3000BC and are thought to have been the source behind the wealth of the Minoans. Indeed, the Cretans had a shipping fleet solely to export their oil (and the cosmetics they also made from it) to the Egyptians and Greeks. All aspects of the tree have been used - the fruit for oil and for table olives, the beautiful wood for utensils, fine furniture and ornaments and the leaves for medicine. In Greek mythology, Thetis was the leader of the Nereids or sea nymphs. Her wedding to the mortal, Peleus, was celebrated on Mount Pelion. She was the mother of Achilles. To escape the persistent interest of Zeus, she once assumed the guise of a cuttlefish. 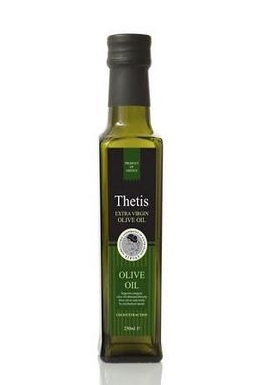 It is this legend from where the cooperative's name of Sipias originates - sipias being the Greek word for cuttlefish. Green olives which are still unripe can be picked from as early as September. These olives produce the much sought after Green oil with the smallest yield but the most intense and fruity flavour and aroma. This oil also has the longest shelf life. Harvesting of the other olives takes place later on as they ripen and turn black, providing more juice per fruit but which is milder, with a less pungent taste and smell. The olives are hand picked to avoid damaging them and are taken as quickly as possible to the mill to prevent the acidity in them rising thus ensuring that the oil is of the highest quality. Olives should be crushed within 24 hours of being picked. They are crushed and pulped and the juice is collected and put through a centrifugal separator, where the rapid spinning eliminates all the remaining water and impurities from the oil. Our cooperative is comprised of a group of twenty olive producers from the municipality of Lyri, in south Pelion. We came together in 2012 with the specific intent of creating an olive mill and bottling plant that would meet ISO22000-certification standards. There are many olive mills of a small scale like ours in Pelion but we are the only one that has achieved ISO22000-certification standards for production and bottling. 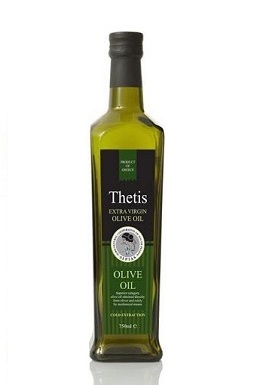 Now, we - Sipias - The Agricultural Cooperative of South Pelion - are proud to offer our truly superior olive oils for export to the rest of the world. Our oils are produced from hand picked olives which are then taken to the mill as quickly as possible to preserve their freshness. There, solely by mechanical means, they are cold pressed, bottled and labelled. We place a high priority on the quality and safety of our products. The whole procedure of processing and packing complies with all national and international food safety and hygiene legislative regulations. We have established a food safety management system that conforms with the principles of HACCP and the Food Management System Standard.